Rex Tillerson is bad at his job. Type “tillerson is the worst secretary of state of all time” into Google, and you will find that virtually every news outlet in the United States has either published an op-ed making that argument, or quoted an academic who swears by it. 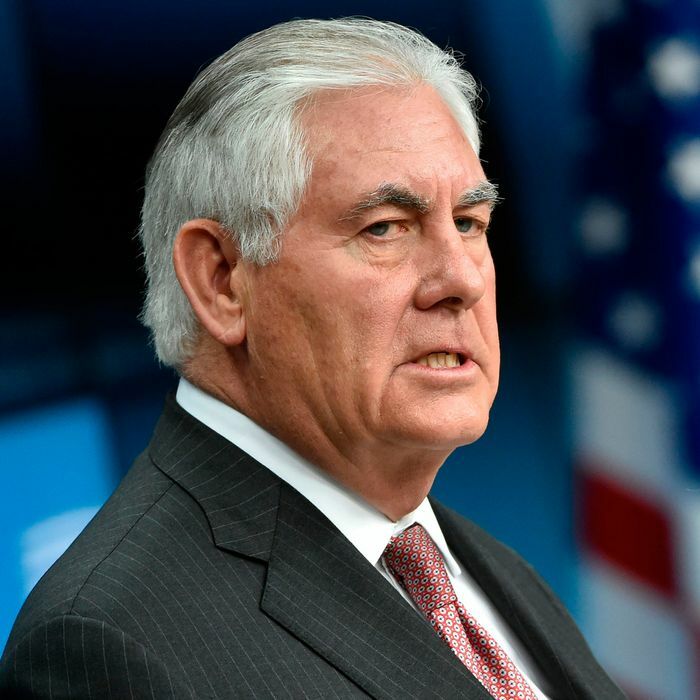 Upon becoming America’s top diplomat, Tillerson fired six of the State Department’s senior officials; instructed the rest to never make eye contact with him; and proceeded to chase more than 100 senior Foreign Service officers out of the bureaucracy. With the United States staring down a nuclear crisis on the Korean peninsula; a handful of forever wars in the Middle East; a rekindled Israel-Palestine conflict; an ascendent Beijing hell-bent on dominating the South China Sea; and renewed tensions with Iran, the former ExxonMobil executive ostensibly decided that the maintaining an experienced Foreign Service was less important than cutting the State Department’s labor costs. So: The president has plenty of good reasons to treat Tillerson to his signature catchphrase. Unfortunately for the citizens of Seoul, Trump has (reportedly) found a bad one. I have spent the past week talking to people who are closely connected to the East Asia folks within this administration…The message I heard was clear. Trump officials working on North Korea have developed the odd consensus that Pyongyang will use its nuclear arsenal to attempt a forcible reunification with South Korea. And if that is the goal, then time is running out for military options that would stop that from happening. This is a remarkable development. It is inconceivable that the U.S. could wipe out Pyongyang’s nuclear, conventional, and biological weapons arsenals in a single surprise attack. Which means that any strike on North Korea would almost certainly result in a retaliatory attack on Seoul — and the deaths of tens of thousands of people, including many U.S. citizens. As Steve Bannon, of all people, said last summer, “There’s no military solution [to North Korea’s nuclear threats], forget it. Until somebody solves the part of the equation that shows me that 10 million people in Seoul don’t die in the first 30 minutes from conventional weapons, I don’t know what you’re talking about, there’s no military solution here, they got us.” White House national security adviser H.R. McMaster — the alleged “adult” in the administration, who was supposed to be a check on Trump’s worst instincts — begs to differ. We’ve said from the diplomatic side we’re ready to talk anytime North Korea would like to talk, and we’re ready to have the first meeting without precondition. Let’s just meet and let’s — we can talk about the weather if you want. We can talk about whether it’s going to be a square table or a round table if that’s what you’re excited about. But can we at least sit down and see each other face to face? And then we can begin to lay out a map, a roadmap of what we might be willing to work towards. I don’t think — it’s not realistic to say we’re only going to talk if you come to the table ready to give up your program. They have too much invested in it. And the President is very realistic about that as well. Tillerson’s core claim here — that Kim Jong-un will never declare his willingness to abandon North Korea’s nuclear program at the outset of direct talks — is nigh-irrefutable. Pyongyang has literally starved its people to death for the sake of its nukes. Last month, a North Korean soldier defected to the South — and South Korean doctors found more (malnutrition-induced) parasitic worms inside of him than they’d thought the human body could withstand. Soldiers are a privileged class in North Korean society. Thus, to say that there can be no talks with Pyongyang until Kim Jong-un formally agrees to put his nuclear program on the table, is to say there can be no diplomatic solution to our conflict with North Korea. [Tillerson’s] comments upset Trump and several senior aides, and set off a cascade of emails and phone calls that ended with a terse statement from press secretary Sarah Huckabee Sanders. National Security Council aides were particularly frustrated with the remarks and complained loudly, administration officials say. Even Tillerson’s own spokesperson, Heather Nauert, repudiated his peace offering. Our policy on #DPRK has not changed. Diplomacy is our top priority through our maximum pressure campaign. We remain open to dialogue when North Korea is willing to conduct a serious & credible dialogue on the peaceful denuclearization, but that time is not now. Tillerson had made a similar call for talks with North Korea during a visit to China in October. Trump abruptly rebuffed him. Tillerson, one White House official said, “had not learned his lesson from the last time,” when Trump publicly rebuked his top diplomat on Twitter over the wisdom of talking to North Korea. … Inside the White House, this person said, there are fairly regular conversations about who will replace Tillerson even as he remains in the job … “I think our allies know at this point he’s not really speaking for the administration,” this Trump official said — a particularly sharp slap given that Tillerson has sought to be a buffer and interpreter for allies angry or bewildered by some of Trump’s actions. … Inside the West Wing, several aides said people close to Trump essentially were counting down the days until Tillerson leaves, which they guess will be in February. For the moment, though, Trump appears content to retain Tillerson as his secretary of State, while assuring the international community that the words of America’s top diplomat count for nothing — which seems like a smart and good way for a military superpower to operate, as it prepares for the imminent possibility of nuclear war.